I finally saw a DVD for the first time in months. I chose Michael Clayton, a film I wanted to see since it was released in mid-2007. 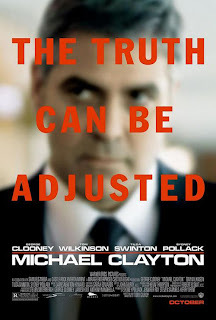 It stars George Clooney, one of my favorite actors, who plays Michael Clayton. It’s a film with great promise, and contains some wonderful performances, but it never reaches its potential. As a thriller the movie fails horribly because it relies on the audience to make a superhuman leap in logic. Clayton is a lawyer by trade, but he’s mostly a fixer, or janitor, cleaning up messes created by clients of a super humongous law firm Clayton works for. A lawyer with great promise, Clayton is a recovering gambler, divorced, penniless, and in debt after a restaurant that was to be his salvation goes belly-up. Clayton wants out but he has no choice but continue to be the firm’s fixer. A job he does very well a senior partner, played by the late Sydney Pollack, often reminds him. Clayton’s latest headache is when the firm’s top litigator, Arthur Edens, played wonderfully by British actor Tom Wilkinson, decides to strip naked during a deposition and then run into the parking a lot. The client, a major agro-business, who is being sued for poisoning small farmers with its fertilizer, is not very happy about the turn of events. Clayton is sent to defuse the situation and bring Arthur in from the cold, so to speak. Clayton realizes Arthur, a manic-depressive, is not only off his medication, but is happily working for the plaintiffs, making their case. The corporation’s chief counsel, an ambitious lawyer named Karen Crowder, played by a rather underutilized Tilda Swinton, takes matters into her own hands. She employs a couple of thugs to murder the litigator and make it look like a suicide. Clayton is deeply disturbed by the litigator’s sudden death, and finds out that he was murdered. Crowder decides it would be better to get rid of Clayton as well. I guess we are suppose to hate Karen Crowder for the power hungry corporate tool that she is, but she comes off more pathetic than evil – lame rather than diabolical. Clayton manages to survive a car bomb, but how he manages to make the connection to Karen Crowder is never bothered to be explored, leaving me, and the probably the audience, scratching their heads. It’s a movie that clocks in around two hours, but the directors try to explain it all in the last five, failing miserably at it and leaving me with a bad taste.